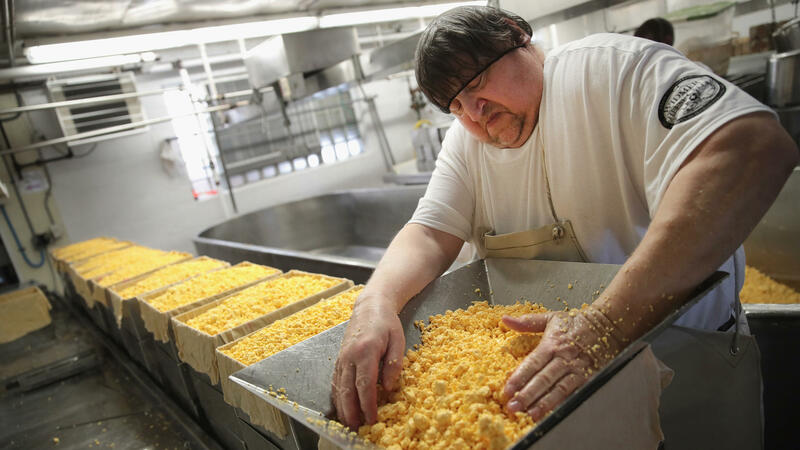 Lenny Zimmel puts Colby cheese curds into forms to make 40-pound blocks of cheese at Widmer's Cheese Cellars in Theresa, Wis. Record dairy production in the U.S. has produced a record surplus of cheese, causing prices to drop. Food banks were happy to hear this news. Cheese is popular among their clients and often hard to get. This government donation will have a significant impact on their operations. Dairy farmers were happy, too, hoping that this government purchase would help relieve what headlines trumpeted as a mountain of cheese that has been driving down the price they get for their milk. As we reported last week, there is in fact an oversupply of dairy products, and it's a global phenomenon. Basically, dairy farmers responded to record-high prices two years ago by expanding production, and then they were blind-sided by a sudden drop in sales to China and Russia. Too much supply and too little demand produced a growing mountain of cheese. But, if we step back and take a broader historical look at this cheese purchase, our current cheese glut looks a lot less impressive. Take a look at this graph of the amount of cheese in storage over the past few decades. The big bulge of stored cheese in the 1980s was accumulated by the government, which supported milk prices by buying large amounts of dairy products — much larger quantities, in fact, than this week's purchase. Now that's a cheese mountain! But the government largely abandoned that effort. Today's growing cheese stockpile is held by private cheese makers, and they need a lot more cheese in storage because they're selling much more of the stuff, especially for pizza. Just contemplate this graph for a minute. There's so much cheese in circulation these days that the USDA's $20 million purchase won't do much for milk prices: It will buy less than 1 percent of the 1.3 billion pounds of cheese that's currently in storage. "I don't expect it to have much actual impact on prices," Mark Stephenson, director of dairy policy analysis at the University of Wisconsin, Madison, told us in an email. "The Chicago Mercantile Exchange spot prices for cheddar cheese were down following the announcement." In case you're wondering, cheddar and mozzarella cheese probably account for most of the cheese stockpile. They are by far the most-consumed types of cheese in America. Meanwhile, Stephenson says, milk prices are now starting to recover on their own. Milk farmers around the world are starting to cut back production, and prices are climbing. Apparently, there's too much cheese in this country. The U.S. Department of Agriculture announced this week that it would buy $20 million worth of the stuff, cheddar mostly, and give it away to food banks. The USDA is doing this, it says, to help, quote, "reduce a cheese surplus that is at a 30-year high." Dairy farmers are happy at this news. That enormous glut of cheese has been driving down the price they get for their milk. Dan Charles is here to talk about all of this with us. He's NPR's food and agriculture correspondent. Good morning. DAN CHARLES, BYLINE: Hi, Renee. MONTAGNE: Why do we have so much cheese? CHARLES: So here is what happened - two years ago, there was actually a shortage of milk and cheese. China was buying up enormous quantities of milk powder, driving up the price, so dairy farmers were doing great. They were making lots of money. They said OK, let's make more money. Let's buy more cows, produce more milk, more cheese. And then everything went wrong. China all of a sudden decided we don't need so much milk powder. They stopped buying. Russia put a ban on cheese from Western Europe, so there was all this cheese in Europe looking for a buyer. And meanwhile, there was a policy change in Europe. They had had quotas on milk production, which limited it. They took those quotas off. Dairy farmers started making more milk. The result was last year, all of a sudden, there was way too much milk, too few buyers, a mountain of cheese building up, milk prices are in the tank and dairy farmers are money. MONTAGNE: You know, it's somewhat amazing that a dairy farmer in New York or California depends so much on global events. CHARLES: Yeah. We think of milk as this local product that the cows produce and we go to the store and pick up. But really only a quarter of the milk that's produced in this country gets sold as fluid milk that people drink. Milk is like crude oil. It goes into processing plants - you know, refineries, you would say - and it gets turned into products that you can trade around the world, like cheese, milk powder, also the byproducts of cheese production - these powdered protein products from the whey. This is a global market. And just like, you know, oil, the prices boom and bust depending on global events. MONTAGNE: You say, though, that there are mountains of cheese in storage. And I'm - I'm just envisioning that. Truly, Dan, mountains of cheese? CHARLES: 1.3 billion pounds, Renee. MONTAGNE: Well, that's a mountain. And what kinds of cheese? CHARLES: Mostly cheddar and mozzarella. Those are, by far, the most popular kinds of cheese in America. MONTAGNE: OK, so the USDA is stepping in, says it will buy $20 million worth of cheese. Will that make much of a difference? CHARLES: No (laughter) $20 million doesn't buy what it used to, Renee. No, it's not so much money compared to the amount of cheese on the market. It will not make much of a difference. This is really just a symbolic effort to help milk farmers. But it's more than symbolic for the food banks. Twenty million dollars' worth of cheese is significant for them, and they are happy to be getting it. MONTAGNE: Dan Charles is NPR's food and agriculture correspondent. Thanks for joining us. CHARLES: Thank you, Renee. Transcript provided by NPR, Copyright NPR.